Back ground: Glandular cardiac myxoma has varying clinical presentation with uncertain histogenesis and debatable immunohistochemical profile. Glandular epithelial differentiations are rare phenomenon known to be present as an intrinsic component of the tumor. The origin of the glands has been attributed to epithelial differentiation of a totipotent cardiomyogenic precursor cells or the entrapped foregut rests in the tumor. Materials and Methods: Retrospective study includes six cases of glandular cardiac myxoma collected over a perior of 4 years. Sections were examined to define the histogenesis, histological and immunohistochemical profile of the glandular elements. 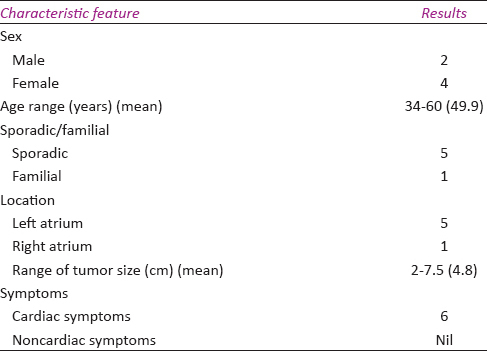 Results: Incidence of glandular cardiac myxoma was 6.6% with a male to female ratio of 1:2.Mean age was 49.9 years. Left atrium was the commonest site. Five were sporadic and one was familial. Chest pain and dyspnea were the commonest clinical symptoms. Histologically all myxoma showed well formed glandular structures with typical myxomatous area. No atypia, mitosis or necrosis was identified in the glandular elements. Markers in six cases of glandular cardiac myxoma were immunopositive for CK7, CK 19, EMA, CEA, focally for E-cadherin while immunonegative for CK20, Chromogranin, Synaptophysin, calretenin, vimentin, B-catenin, TTF-1 and GCDFP-15 favoring enteric differentiation. Conclusion: Glandular cardiac myxoma is a rare entity which shows characteristics similar to those of classical cardiac myxoma with benign glandular elements showing enteric differentiation. Complete surgical excision is the treatment of choice with good prognosis. It is important to recognize this entity to avoid an erroneous diagnosis of metastatic adenocarcinoma. Glandular cardiac myxoma is a rare entity constituting <3% of all cardiac myxomas. Histologically, they are characterized by a classical cardiac myxoma with benign glandular elements. The histogenesis of glandular components within the myxomatous stroma remains unclear. Current concept states that these glands are either from an entrapped foregut rest  or as a glandular differentiation of totipotent cardiomyogenic precursor cells. It is necessary to recognize the benign glandular structures as the intrinsic elements of glandular cardiac myxoma, failure of which may lead to an erroneous diagnosis of metastatic mucin-secreting adenocarcinoma. With this background, the present study is undertaken to characterize the glandular elements with a panel of organ-specific immunohistochemical markers in six glandular cardiac myxoma cases. Particular emphasis has been paid to the histological and immunohistochemical profile of glandular elements along with review of literature. The present study is a retrospective evaluation of six cases of glandular cardiac myxoma out of ninety cases of myxoma reported over the period of 4 years (from 2009 to 2014). Clinical details and histopathology slides and blocks of these cases were retrieved from the archival record sections. A mean of 4 (range 2–6) paraffin-embedded blocks per tumor was made for routine histological evaluation. For light microscopy, sections were stained with routine hematoxylin and eosin for histological evaluation and special histochemical stain like Alcian blue-periodic acid–Schiff (AB-PAS) stain was done to characterize the type of mucin production. For immunohistochemical analysis, representative sections were stained with the following panel of antibodies: (1) Epithelial markers (pan cytokeratin [CK], CK7, CK19, CK20, epithelial membrane antigen [EMA], carcinoembryonic antigen [CEA], E-cadherin, and beta-catenin), (2) Mesenchymal markers (vimentin and smooth muscle actin [SMA]), (3) Neuroendocrine markers (chromogranin and synaptophysin), (4) Endothelial markers (CD31 and CD34), (5) Organ-specific markers (calretinin, thyroid transcription factor [TTF-1], gross cystic disease fluid protein [GCDFP-15]), and (6) proliferating marker (MIB-1). Antigen retrieval was done by heating the slides in citrate buffer (0.01 mol/L, pH 6.0) in a microwave oven (two 5-min passages at 650 Rpm). Immune reaction was revealed by DAKO EnVision system by incubating the slides for 30 min with primary antibodies at room temperature. Immunoreactivity was demonstrated by application of the Rabbit/Mouse EnVision reagent (30 min) and chromogenic substrate (DAB) for 5 min. The slides were counterstained with Harris hematoxylin solution and mounted in distrene, plasticiser, and xylene (DPX) medium. Positive and negative controls were set for comparison. Immunohistochemical features were considered positive when at least 5% of the respective cells showed immunopositivity. Overall incidence of glandular cardiac myxoma was 6.6%. Out of the six cases included, two were male and four were female with a male-to-female ratio of 1:2 [Table 1]. The mean age of presentation was 49.9 years (range 34–60 years). In five cases, the tumor was located in the left atrium while one showed biatrial location. The tumor was sporadic in five and familial in one. In the familial biatrial myxoma only right atrial myxoma showed glandular elements. None of the cases were associated with Carney complex. In all the six cases, the patients presented with cardiac-related symptoms including chest pain, tightness, dyspnea, palpitation, and heart murmur. None of the cases had prior history of adenocarcinoma at the time of tumor detection or subsequently during the follow-up. No tumor metastasis was observed during follow-up over a period of 14 months. On gross examination, all the myxoma specimens were globular and spherical with a smooth and focal papillary surface. The size of the tumors varied from 2 cm to 7.5 cm with the mean tumor size of 4.8 cm. Cut surface of all the cases showed gelatinous and myxoid appearance with focal areas of congestion and hemorrhage. On microscopic examination, all showed predominantly classical myxoma [Figure 1]a component with varying proportion of glandular elements [Figure 1]b. The stellate stromal cells were cytologically bland with round-to-ovoid nuclei, dispersed chromatin, and inconspicuous nucleoli without any mitosis. They were distributed singly in cords and in clusters with occasional vascular structures consisting of capillary-like spaces containing red blood cells. Focal areas of hemorrhage, cystic change, fibrosis, and chronic inflammatory infiltrate with predominant lymphocytes were identified in varying proportions along with hemosiderin-laden macrophages. Two cases showed Gamna-Gandy body in the stroma. Although cartilaginous, osseous, and hematopoietic differentiations have been described in myxoma, none of the cases showed such associated histological finding. Two cases showed the presence of few haphazardly arranged benign smooth muscle bundles near the base. The glandular component in all the five cases consisted of irregularly shaped glands of varying number lined by a single layer of columnar cells with focal stratification and interspersed goblet cells. The nuclei of these glandular cells were basally located, monomorphic with vesicular chromatin and tiny inconspicuous nucleoli. Histological evidence of cellular atypia, abnormal mitosis, or dysplasia was not identified in any of the cases of glandular cardiac myxoma. The extent of the glandular elements was variable among the cases. In four cases, the glands represented 5%–10% of the total tumor area while they were <5% in the remaining two. The glandular component in all the cases was identified at the base near the site of attachment with intervening thick-walled blood vessels. AB-PAS staining at pH 2.5 revealed the presence of bluish-colored acidic mucin in majority of the goblet cells favoring colonic epithelial differentiation [Figure 1]c.
Glandular elements in five cases showed immunopositivity [Table 2] for the epithelial markers (pan CK, CK7, CK19, EMA, and CEA) and cell adhesion molecules (E-cadherin and B-catenin) while they were immunonegative for CK20, mesenchymal markers (vimentin and SMA), neuroendocrine markers (chromogranin and synaptophysin), endothelial markers (CD31 and CD34), and other organ-specific markers (TTF1, GCDFP-15, and calretinin). The pattern of staining for CK7, CK19, and EMA was diffusely cytoplasmic whereas the staining for CEA was limited to the luminal border of the glandular epithelium. Proliferative index (Ki-67) was <1% in all cases [Figure 1]d,[Figure 1]e,[Figure 1]f,[Figure 1]g,[Figure 1]h,[Figure 1]i. Vimentin, CD31, and CD34 staining were limited to the endothelial cell lining the vascular structure, but the glandular epithelium was nonreactive. Immunohistochemical stains could not be performed in one case because of scant glandular component which got exhausted during subsequent sections. Anderson was the first to describe glandular cardiac myxoma in 1946. Till date, fewer than fifty cases have been reported in the literature with present being the second largest case report series. Glandular cardiac myxoma is mostly sporadic in occurrence and mainly seen in adults with female preponderance. The left atrium is the most frequently involved chamber followed by the right atrium. Various hypotheses have been proposed for the glandular differentiation within the classical cardiac myxoma. The possibility of entrapped foregut rests, divergent differentiation of subendocardial lepidic cells, and progressive differentiation of myxoma into glands, all have been attributed as the possible mechanism. In the present study, the histochemical and immunohistochemical profile of the glandular component showed positivity for epithelial markers. In all the five cases, glandular elements showed positivity for pan CK, CK7, EMA, and CEA while negative for CK20, thus showing a possibility of differentiation toward coelomic epithelial tissue. Mesenchymal cells or endothelial cells generally do not show immunopositivity for keratin, EMA, or CEA. Hence, the presence of epithelial component within the mesenchymal component favors the concept of epithelial differentiation from the undifferentiated precursor cells. Some people have also raised question of glandular elements arising from the mesothelial tissue, but although mesothelial tissue may express epithelial markers,, they generally do not produce mucin and are negative for mucin stain (PAS-D). In addition, they express calretinin supporting to their diagnosis. Hence, the possibility of glandular cardiac myxoma arising from mesothelial cells is unlikely. It is also observed that the glandular lining epithelium was negative for other organ-specific markers such as calretinin, CK20, TTF-1, and GCDFP-15 and for neuroendocrine markers such as chromogranin A and synaptophysin. Clinical history plays an important role to rule out adenocarcinoma as the morphology at times resembles the same. However, clinical history has certain limitations. Various studies conducted earlier focused mainly on the histological features to differentiate glandular cardiac myxoma from metastatic adenocarcinoma. A study conducted by Berger et al. suggested that invasion of the tumor into the adjacent cardiac wall was more indicative of a carcinoma. There has been a single case report of benign glandular cardiac myxoma extending beyond the subendocardium and invading the underlying myocardium., Hence, identifying this single criterion is not sufficient to label it as a malignant process. The presence of glandular cardiac myxoma with atypical glandular components or with infiltrative, destructive tumor emboli and metastasizing behavior should be considered as a feature of malignancy. Studies conducted by Gould  and Rosen  showed that immunohistochemical staining may not reliably predict the cell of origin of tumor. This also holds well in our study that all the glands showed positive colonic epithelial markers which were helpful in identifying its nature but not its cell of origin. The treatment of choice for benign cardiac myxoma or glandular cardiac myxoma is complete surgical excision with excellent prognosis. [18.19] However, intracardiac recurrence has been noted in 12%–22% of familial and 1%–4% of sporadic cases. Most common cause of this recurrence is due to multicentricity of the lesion, incomplete surgical removal, existence, and proliferation of reserve cells in the myocardium., The existence of extracardiac recurrence of cardiac myxoma has been reported and occurs due to intraoperative dissemination of tumor cells and their growth at the site of dissemination. Glandular cardiac myxoma is a rare benign entity with a good prognosis like any other conventional cardiac myxoma, thought to be arising from pluripotent subendocardial undifferentiated cell. It is very important to recognize this entity to avoid an erroneous diagnosis of metastatic adenocarcinoma. Lack of cellular atypia, mitosis, or invasion favors its benign nature. Complete surgical excision remains the treatment of choice. Pucci A, Gagliardotto P, Zanini C, Pansini S, di Summa M, Mollo F, et al. Histopathologic and clinical characterization of cardiac myxoma: Review of 53 cases from a single institution. Am Heart J 2000;140:134-8. Pucci A, Bartoloni G, Tessitore E, Carney JA, Papotti M. Cytokeratin profile and neuroendocrine cells in the glandular component of cardiac myxoma. Virchows Arch 2003;443:618-24. Namura O, Saitoh M, Moro H, Watanabe H, Sogawa M, Nishikura K, et al. A case of biatrial multiple myxomas with glandular structure. Ann Thorac Cardiovasc Surg 2007;13:423-7. Fabian JT, Rose AG. Tumors of the heart: A study of 89 cases. S Afr Med J 1982;61:71-7. Curschellas E, Toia D, Borner M, Mihatsch MJ, Gudat F. Cardiac myxomas: Immunohistochemical study of benign and malignant variants. Virchows Arch A Pathol Anat Histopathol 1991;418:485-91. Yokomuro H, Yoshihara K, Watanabe Y, Shiono N, Koyama N, Takanashi Y, et al. The variations in the immunologic features and interleukin-6 levels for the surgical treatment of cardiac myxomas. Surg Today 2007;37:750-3. Diflo T, Cantelmo NL, Haudenschild CC, Watkins MT. Atrial myxoma with remote metastasis: Case report and review of the literature. Surgery 1992;111:352-6. Moiyadi AV, Moiyadi AA, Sampath S, Kalpana SR, Mahadevan A, Shankar SK, et al. Intracranial metastasis from a glandular variant of atrial myxoma. Acta Neurochir (Wien) 2007;149:1157-62. Eckhardt BP, Dommann-Scherrer CC, Stuckmann G, Zollikofer CL, Wentz KU. Giant cardiac myxoma with malignant transformed glandular structures. Eur Radiol 2003;13:2099-102. Kodama H, Hirotani T, Suzuki Y, Ogawa S, Yamazaki K. Cardiomyogenic differentiation in cardiac myxoma expressing lineage-specific transcription factors. Am J Pathol 2002;161:381-9. Holden J, Churg A. Immunohistochemical staining for keratin and carcinoembryonic antigen in the diagnosis of malignant mesothelioma. Am J Surg Pathol 1984;8:277-9. Corson JM, Weiss LM, Banks-Schlegel SP, Pinkus GS. 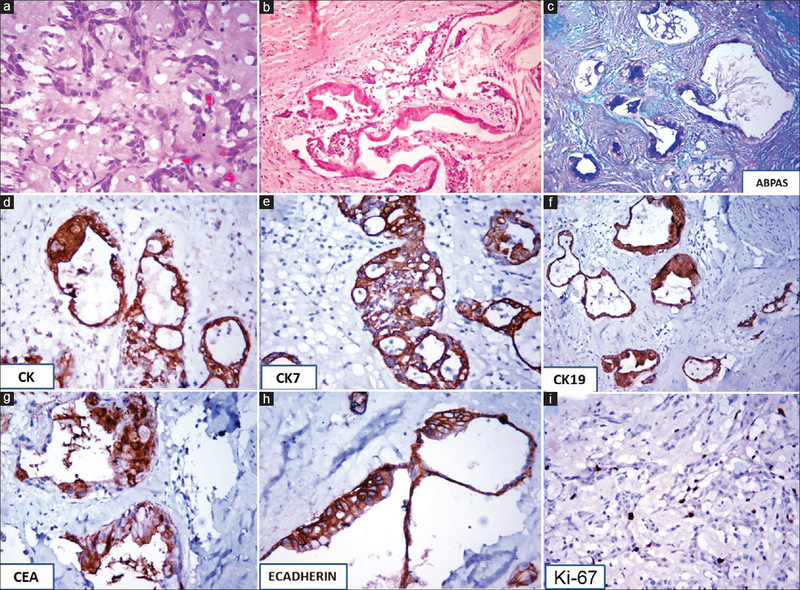 Keratin proteins and carcinoembryonic antigen in synovial sarcomas: An immunohistochemical study of 24 cases. Hum Pathol 1984;15:615-21. Morales AR, Fine G, Castro A, Nadgi M. Cardiac myxoma (endocardioma): An immunohistochemical assessment of histogenesis. Hum Pathol 1981;12:896-9. Berger MD, Schneider J, Ballmer PE, Eckhardt BP, Dommann-Scherrer C. Mucin-producing adenocarcinoma arising in an atrial myxoma. Ann Diagn Pathol 2013;17:104-7.
den Bakker MA, Dinjens WN, Bekkers JA. Cardiac myxoma with atypical glandular component, report of a case. Histopathology 2006;48:206-8. Gould VE. Histogenesis and differentiation: A re-evaluation of these concepts as criteria for the classification of tumors. Hum Pathol 1986;17:212-5. Rosen L. Specificity of CEA and primary germ layers. Hum Pathol 1985;16:1077. Butany J, Nair V, Naseemuddin A, Nair GM, Catton C, Yau T. Cardiac tumours: Diagnosis and management. Lancet Oncol. 2005 ;6:219-28. Reber D, Birnbaum DE. Recurrent cardiac myxoma: Why it occurs. A case report with literature review. J Cardiovasc Surg (Torino) 2001;42:345-8. Amano J, Kono T, Wada Y, Zhang T, Koide N, Fujimori M, et al. Cardiac myxoma: Its origin and tumor characteristics. Ann Thorac Cardiovasc Surg 2003;9:215-21.